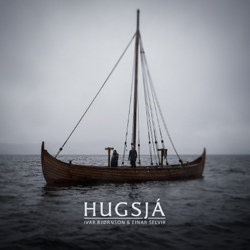 After the success of their previous collaboration “Skuggsjá“, Ivar Bjørnson (Enslaved) and Einar Selvik (Wardruna) are now following up with an imposing new piece entitled “Hugsjá“, scheduled for release on April 20th 2018, through ByNorse Music. The word ‘Hugsjá’ means to see with, or within, the mind – and it reflects the idea that one’s mind has the potential to see further than the eyes can reach. By weaving together indigenous and contemporary thoughts, sounds and instruments, they are inviting you on a vivid journey – exploring the distant history and traditions along coastal Norway. “Hugsjá” was first commissioned by, and performed at, Bergen International Festival in 2017, as part a series of concerts named “Nordvegen” (the Northern Road); inspired by local history and traditions in each of the places visited. Ultimately the material was recorded and became this full-length album. You can order the physical formats in ByNorse Music official webshop or by the band’s official merch store. The songs “Ni Mødre av Sol” and “Um Heilage Fjell” feature a mixed choir under management of Stine Kobbeltvedt with the voices of: Anna Lisa Lekven, Laila Moberg, Marianne Evensen Østrem, Lisa Nøttseter, Lise Renee Aase, Kristine Bjånesøy Tikkanen, Linda Nytræ, Leif Østrem, Brede Lærum, Jan Helge Kordts, Jan-Ove Hansen, Richard Myhre Gåssand and Stine Kobbeltvedt.